What a hoot! I loved driving the Abarth 595 Competizione for the whole week I spent in it. Partly for its lively attitude to the road, but chiefly because of the attention and pleasure it gave to other road users, even to pedestrians would you believe. I’ve had the pleasure of piloting Italian supercars – Ferraris, Maseratis and Lamborghinis (tough lives we motoring journos lead…). While these often get gazed at in envy and other drivers like to race them off the lights, sometimes these ultra expensive machines get me glared at, even to the extent of visual hatred on a couple of occasions. 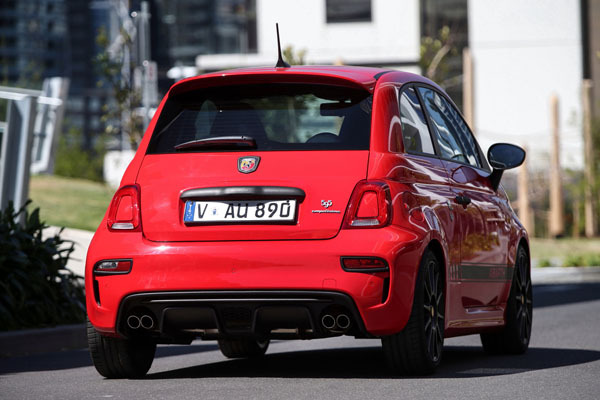 But it seems everyone liked the Abarth 595 Competizione for its appearance and the raucous noise from the exhaust. They smiled, gave it a thumbs up and generally seemed to enjoy it adding life to endlessly boring grey cars on our roads these days. Our road test car was in very Italian red, set off by 17-inch Corsa alloy wheels in black and yellow brake calipers. Then there’s the blacked out lower grille and rear diffuser, and standout black decals which include bold ‘Abarth’ lettering on the flanks. Subtle? No way, this Abarth is (a) Italian and (b) a hot-hatch – so subtle was never going to be on the stylists’ minds. Abarth 595 is offered as three-door hatch and a cabriolet, the latter having a very large fabric sunroof, not a conventional soft top. The Competizione is only offered as a hatch. We have a much loved a Fiat 500 by Gucci cabriolet in our family but somehow the hardtop suits the Competizione better. Abarth 595 Competizione is powered by a 1.4-litre turbocharged four-cylinder engine with 132 kW of power and 250 Nm of torque. There’s also a lower cost model, the $26,990 Abarth 595 with 107 kW. Power is taken to the front wheels by way of a five-speed manual gearbox, six would have been better, but the Fiat 500 on which the Abarth hotshot is based is getting on in years. There’s also a robotised five-speed sort-of automatic transmission – Yuk. The complete Abarth 595 range received a major infotainment upgrade earlier in the year. 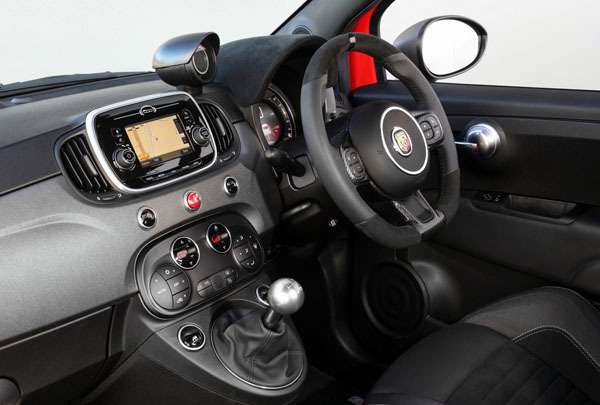 Controlled through a Fiat Uconnect 5.0-inch colour touchscreen and integrated voice control, it provides satellite navigation, Bluetooth audio streaming, AM/FM/DAB radio and UConnect Live services. The screen’s too small but easier to use than we expected. 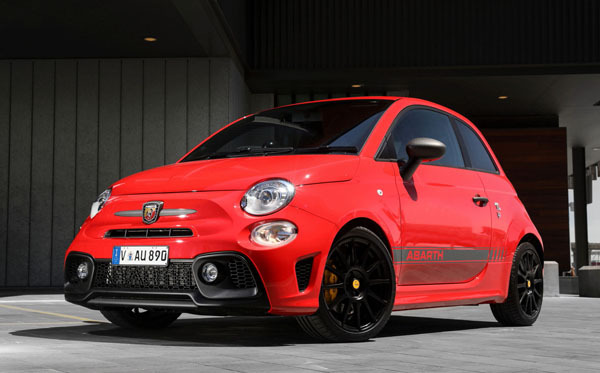 Abarth 595 Competizione is aimed at the serious driver. It has 17-inch Corsa alloy wheels, Michelin Pilot Sport tyres, Koni shock absorbers, four-piston front Brembo brakes and a dual-mode quad-tip ‘Record Monza’ exhaust. Zero to 100 km/h is listed as 6.7 seconds, but the lively nature of this little hotshot makes if feel even quicker. Throttle response from the turbo engine is pretty good, but could be sharper. Once it’s up to full boost the little car really comes alive. Exhaust noises give the little Italian a fair bit of aural pleasure – though perhaps not to the standard of that provided by its Uncle Maserati. Have it in sport mode and keep the revs way up and it will even give you some lovely snap-crackle-and-pop. The actions of the five-speed gearbox should be slicker – and did we say that a six-speed would be nice? It would certainly be appreciated during motorway running. Handling is excellent, with plenty of grip, the ability to change direction at a moment’s notice when required. There’s good response to the throttle and steering. Eventually it will understeer if you push too hard but that’s probably a sign of the humble beginnings of the 500 on which it is based. Ride comfort suffers quite a bit on roughish surfaces but isn’t too bad on normal roads. If you’re a serious driver you won’t mind this, but if you want the looks and a bit more comfort it’s probably best to go for the standard 595 not the Competizione. Some don’t like the high driving position of the Abarth and Fiat 500 at first. As we’ve had 500s in the family for seven years now I’m thoroughly tuned into the feel. If you’re doing a pre-purchase test drive may I suggest you spend plenty of time behind the wheel. I still don’t like the lack of left-foot space. Note: These prices do not include government or dealer delivery charges. Contact your local Abarth dealer for drive-away prices.